A quaint little bay right in the heart of Cadaqués in front of the Church of Santa Maria. 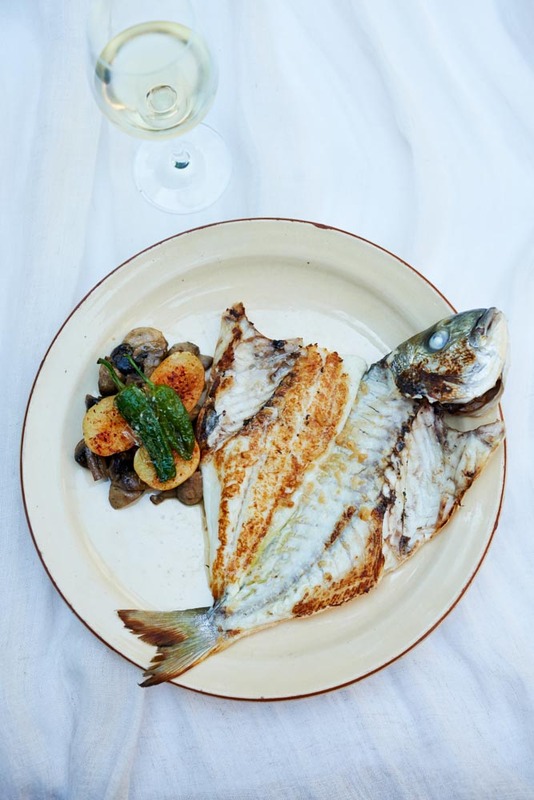 Grilled fresh fish for lunch in Cadaqués, Spain (photo: Mikkel Vang). 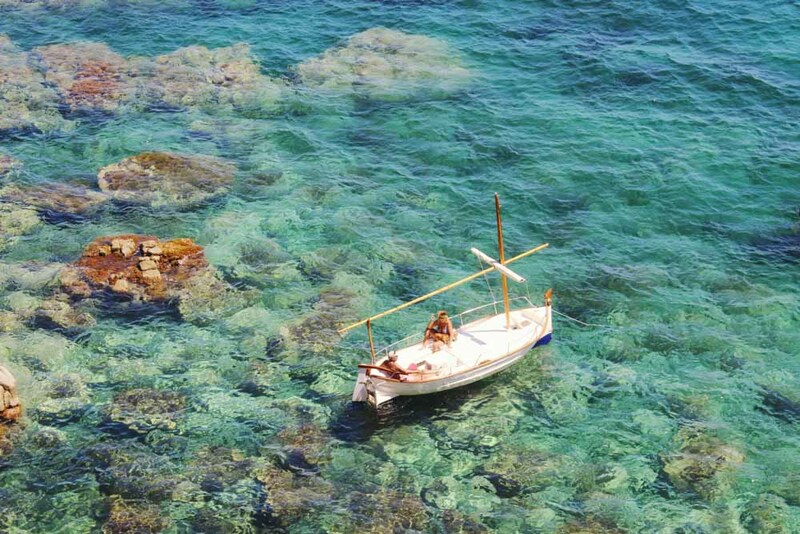 The coastline around Cadaqués has an abundance of inlets ripe for exploration by boat (photo: Mikkel Vang). 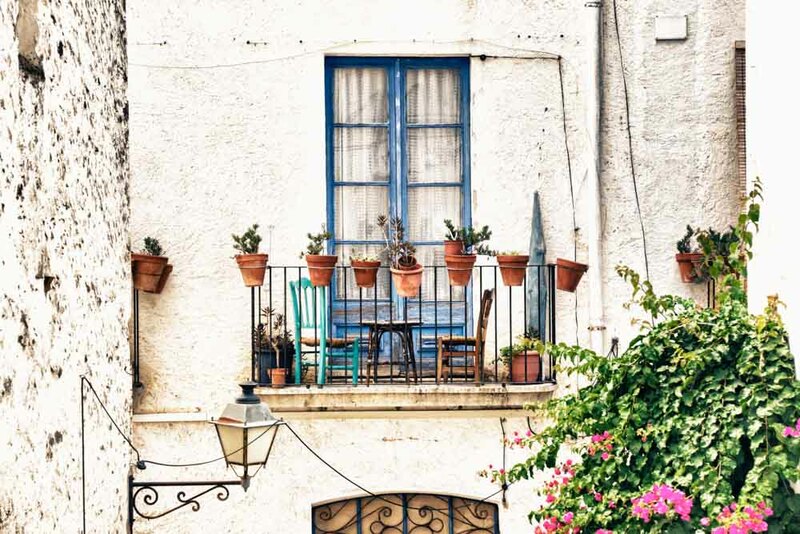 Terracotta rooftops in Cadaqués, form a striking contrast with the blue of the Mediterranean sea (photo: Mikkel Vang). Basking in the sun on the turquoise waters of the Mediterranean. 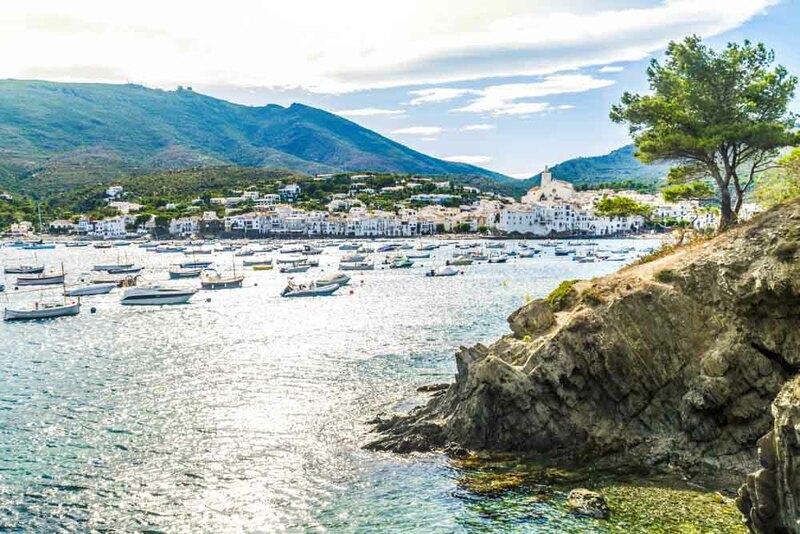 It's no surprise why Cadaqués is considered by many Catalans to be the ‘Pearl of the Costa Brava’. One of the many secluded beaches and coves to explore in the Spanish town of Cadaqués. Cadaqués is hemmed by lush, green hills. Charming white-washed buildings in the Old Town of Cadaqués. Home to the sublime landscape of Cap de Creus, delectable seafood and the ghost of Salvador Dalí, Cadaqués on Spain’s wind-blown easternmost tip is a world away from the Costa Brava most know. I am one of a small group of people with our heads out the bus window on a road that winds its way along the edge of Spain’s east coast, disappearing around a corner every now and then, before re-emerging again to stunning water views. 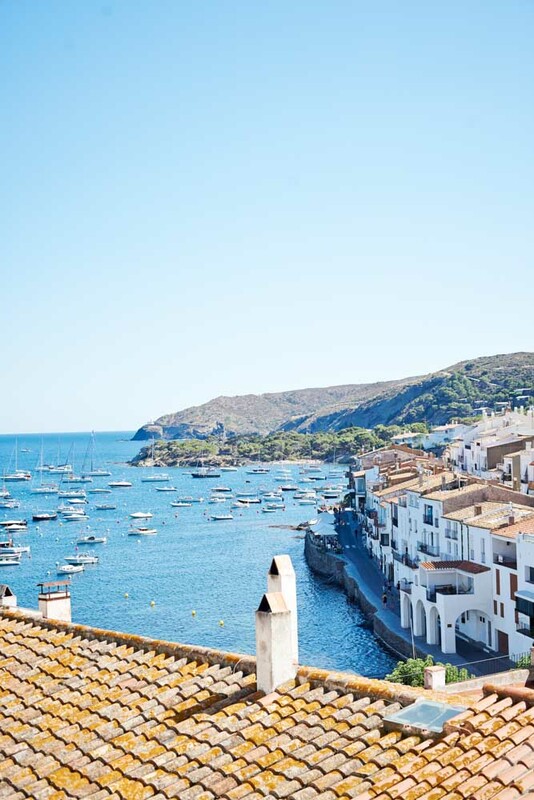 Soon, the white-washed visage of Cadaqués makes an appearance: a cluster of tiny houses on a slope, their burnt red terracotta roofs in strong contrast against the steely grey of a subdued Mediterranean and the pale blue of the sky. 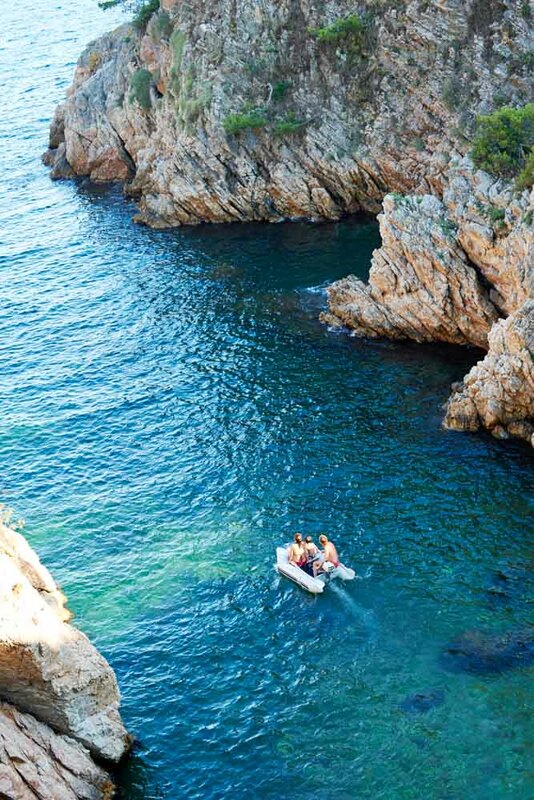 Just over a two-hour drive from Barcelona, this former fishing village remains largely off the itineraries of most tourists due to its isolated location on the Cap de Creus peninsula and the absence of the golden sandy beaches that dot the rest of Costa Brava. Cadaqués endures the wrath of the Tramontana wind that blows off the Pyrenees and gives the Spanish coast its name: Costa Brava or Wild Coast. Particularly fierce in winter, it was known to cause damage to property and drive residents to depression. The origin of the name Cadaqués isn’t clear; some say it’s derived from Cap de Quers or ‘Cape of Rocks’ due to the landscape of Cap de Creus, a natural park in the area, while others think it comes from the name of the coastal shrub present here. Over the centuries, it wasn’t just the rough weather and choppy sea that rendered life in the village challenging; it was frequently invaded and plundered by pirates who took advantage of the isolated location and captured local sailors. Much later, its rugged quality and seclusion made the town a favourite of artists such as Pablo Picasso, Marcel Duchamp, and most notably Salvador Dalí, who went on to build a home chock-full of eccentricities in nearby Port Lligat. Today, the pebbled seafront enjoys a quiet serenity that’s unaffected by the few summertime visitors. An hour after I arrive, I find myself in the central square of Plaça Passeig, where day trippers shop at trendy boutiques, tuck into pancakes at a corner stall, take photos with Dalí’s statue and enjoy wine and tapas in the candlelit warmth of seafront cafes. I turn my attention to the restless Mediterranean and spend a few minutes on the pebbled coastline submitting to the mighty force of the wind that pushes me away. If I want to stay longer, I will have to sit down on one of the beachfront benches, but with just about an hour left until sunset, I move on and explore the Old Town instead. “The best way to see Cadaqués is to get lost in the Old Town,” I’m told by a woman who I stop to ask for directions to the tourist office. I slip my map into my daypack and do just that. Basking in the sun on the turquoise waters of the Mediterranean. 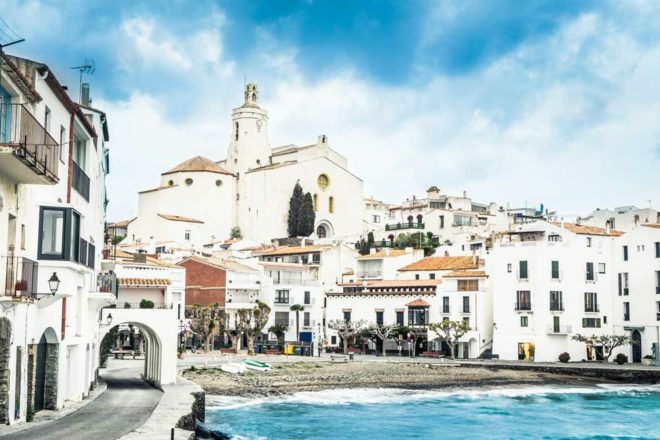 It’s no surprise why Cadaqués is considered by many Catalans to be the ‘Pearl of the Costa Brava’. The slate cobbled streets bring me outside homes, guesthouses and galleries, two- or three-floored white buildings with blue doors and bluer windows dressed in pink bougainvillea and elaborate wrought-iron balustrades. Dalí’s piercing eyes stare at me from the painted door of a cleverly disguised fuse box outside the front door of a house. It’s clear that Cadaqués hasn’t forgotten Dalí, for he makes several appearances on fuse boxes and windows around town. I turn around a corner to follow the sound of church bells and find myself outside the Church of Santa Maria. Here, the highest point of the Old Town offers an incredible view; clusters of reddish brown-tiled roofs and grey cobblestone alleys meander down to a coastline that gives way to a sea speckled with sailboats. Reluctantly, I break away from the scene and enter the church. Local fishermen rebuilt the 16th-century Gothic-style church after it was destroyed by the fearsome Turkish pirate Barbarossa in 1543. Its most impressive feature is the 18th-century Baroque altarpiece designed by Jacint Moretó and sculpted by Pau Costa and Joan Torres. With the sun slowly melting from the sky, I watch it set with a glass of sparkling cava and a platter of pinxtos; cod croquettes, omelette, pa amb tomàquet (Catalan tomato bread) and green olives. I listen to Marta, the hostess, describe the beauty of the Cap de Creus Natural Park. The next morning, I’m on a trail walking to Salvador Dalí House, the artist’s only permanent home from 1930 to 1982 in the nearby village of Port Lligat. Originally a simple fisherman’s hut, additions to the house continued up until the mid-1970s. For much of his adult life, Dalí was almost as enamoured with the sublime landscape of the Cap de Creus peninsula as he was with his muse Gala; references to geological features in the Cap de Creus Natural Park, Cadaqués, and Port Lligat abound in some of his most celebrated pieces such as The Madonna of Port Lligat (1949) and Figure at the Window (1925). A guided tour of the house gives a rare insight into Dalí’s life and his whimsical tastes. From the bejewelled bear that greets visitors in the lobby to the trio of storks symbolising immortality perched above a bookshelf, to the bedroom mirror placed to reflect the first rays of the sun and the semi-circular whispering room, the house is full of unique objects and spaces created by Dalí. They remain as they were last left by him. While the interior of Salvador Dalí House is equal parts quirky and intense, the swimming pool area makes me smile, with its giant pink lips-shaped sofa at its centre surrounded by an installation of Pirelli-tyre signs. Outside, the olive grove that looks upon Port Lligat once served as an outdoor studio for Dalí, who spent his days painting and sculpting in the garden. By early afternoon, I’m in an electric golf car on the only road from Port Lligat to Cap de Creus Natural Park, eight kilometres away on the eastern tip of the Iberian Peninsula. “Look,” says my driver Diego, pointing to a hidden golden bay. “Bonito eh?” he smiles, adding, “My English is no good”. The road is flanked by pockets of elms, pines and oaks as far as the eye can see. Sculpted by the ferocity of the Tramontana, the dramatic landscape of rock formations, scrub and coves, painted in grey, green, turquoise and ochre, is as beautiful as Marta suggested, no mean feat in a region as stunningly picturesque as this. Outside the Bar Sa Freu, at the viewpoint by the Cap de Creus Lighthouse, I admire the perfect curve of the infinite horizon and jagged charcoal fingers reaching out to the sea. The wind slaps my hair across my face and I begin to understand Dalí’s obsession with this, the Costa Brava’s most primal spot, where the wild wind blows. Drive to Cadaqués from Barcelona (two and a half hours) or Figueres (40 minutes). Alternatively take the bus from Barcelona’s Nord Bus Station to Cadaqués (three hours). In May, June and September you’ll find good weather and fewer visitors. • Horta d’en Rahola – A lovely 18th-century family home turned hotel with its own restaurant, just a few minutes’ walk from the seafront. • Hotel Nou Estrelles – If you’re on a budget, this hotel offers good value with bright décor and cosy rooms. Local specialities include lobster, mussels, cuttlefish, sea urchins, sardines and anchovies. • Casa Anita – A legend in the Cadaqués culinary scene, where you can expect communal seating and traditional seafood. • Compartir – Finer dining with elaborate appetisers for sharing. • Bar Melitón – For the ultimate sundowner with amazing views of the Mediterranean. You can get even further away from the crowds by visiting the cobbled medieval town of Begur. 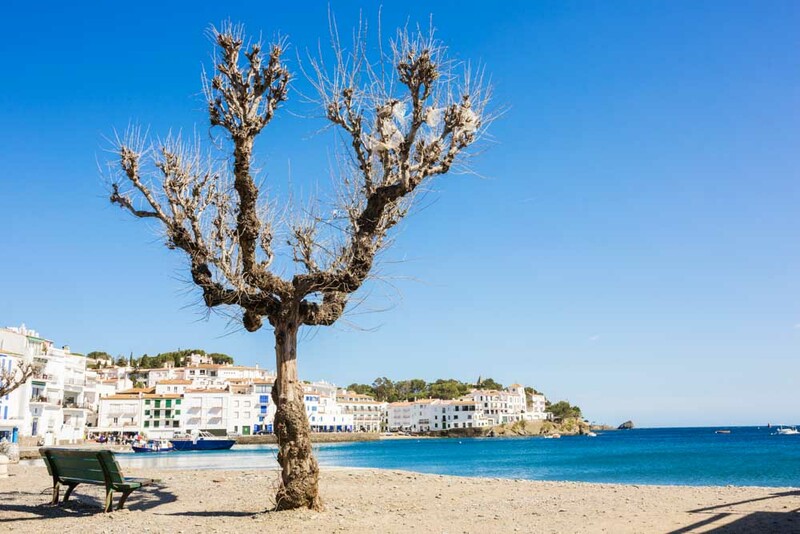 A little over an hour’s drive from Cadaqués, this charming Catalan village is known for its Spanish and Moorish architecture, beautiful houses, quaint boutiques and restaurants, and hilltop castle. Entry to Salvador Dalí House is by advanced booking only, so log on to the website to buy tickets before turning up on the doorstep.